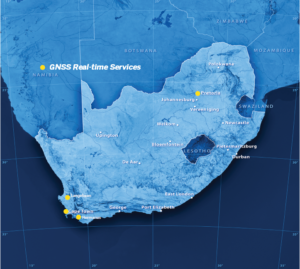 From four operational stations in 1999 to over more than 58 operational stations today including plans for continued growth in the future, South Africa is a prime example of how a GNSS Infrastructure system can evolve through scalable implementation of Trimble infrastructure solutions. TrigNet was initially set up in South Africa in 1999 by the Chief Directorate: Surveys and Mapping of the Department of Land Affairs to reduce the cost of surveys for land reform projects. The network is managed and controlled by a single control center located in South Africa’s National Geospatial Information (NGI) offices, which makes data from all stations available in RINEX (Receiver Independent Exchange) format. Originally setup as only four permanent reference stations, TrigNet has grown to meet the needs of the country by providing more dense coverage in some areas than others. All stations record 1 second epoch data on both GPS frequencies (L1 and L2) via geodetic standard choke ring antennas. At its inception in 2009, Trignet only consisted of 4 CORS. The network of over 58 permanent operating stations is distributed throughout South Africa at approximately 100 km to 300 km spacing depending on the area. The network provides Differential Global Positioning System (DGPS) coverage country-wide as well as single-base real-time kinematic (RTK) positioning from all stations. In 2011, TrigNet operates more than 58 stations. In its principal urban regions of Western Cape Town, Gauteng, and Kwa-Zulu Natal, a network RTK solution is provided. In these regions,users can take advantage of Trimble® VRS™ (Virtual Reference Station) technology to improve real-time accuracy. 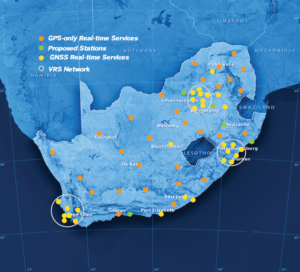 South Africa has tailored its GNSS infrastructure system to fit its needs, outfitting its more urban areas with VRS and then providing sparse coverage in the less populous areas. Today, TrigNet is one of the most advanced infrastructure systems on the entire African continent. The country continues to look toward the future of the TrigNet network, which includes densification along the Southern Cape Coast, Northern Free State, and Central Cape plans to integrate all TrigNet stations into a virtual private network (VPN), and an increased number of GPS/GLONASS receivers. Manage the entire cadastral data collection process from field work to office deliverables with GNSS, GIS, and survey technologies.